Time is a rare and precious resource that can't be reproduced, so optimizing each minute we spend is a value far greater than money can buy. One way to accomplish this goal is by using intranet tools to increase productivity. 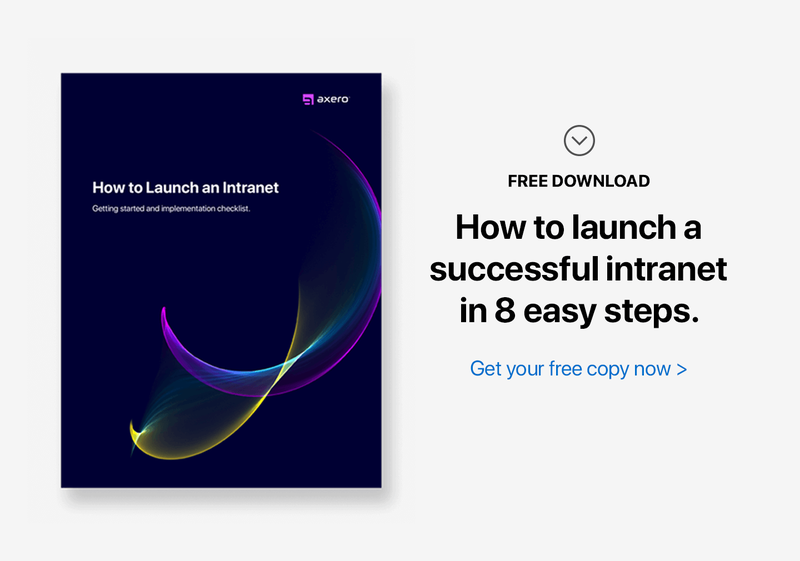 If you are considering using social intranet software at your company, here are six time-consuming processes that it will drastically reduce, or eliminate entirely. Email is one of the primary processes intranet tools can reduce. You can easily accumulate 30 emails and responses from one initial email sent to a group of 5-6 people. Individuals often respond to emails out of obligation ... to make sure everyone else knows they received the email, or to put in their obligatory two-cents. Just think about the number of emails you have received that only include a simple "thank you" or confirmation that the recipient received the information you sent. With an intranet chat platform, instant messaging, and a string of previous responses, you can not only eliminate a huge amount of clutter in your inbox, but free up a lot of space on your email server as well. As an added benefit, because employees won’t have to wade through as much clutter, their productivity levels may increase as a result of the time they get back. In a disorganized company, individuals can lose countless hours simply looking for the information they need. This can happen on many levels ... from an individual level, up to the department, and potentially to the entire company. While intranet tools cannot magically make a naturally disorganized person organized, it does provide a great organizational foundation. By assigning the task of creating and managing organizational structure to a few members at each level, you can keep files and information easily accessible to all. Onboarding is typically a long, time-consuming process for HR departments that want to properly train new employees. Intranet tools can drastically reduce the number of hours for onboarding by providing HR departments with a structure for organizing key documents. Instead of having an HR professional sit down with a new employee who is filling out paperwork, that same HR professional can direct new employees to specific locations within the company intranet where they can find and complete the required paperwork. In addition, while there is no substitute for face-to-face interaction, intranet tools allow HR professionals to check up on new employees instantly, and electronically, through dashboard communications. In large businesses, especially when multiple people are required to attend a meeting, it can be very difficult accommodate everyone's availability. Often, numerous emails circulate among the parties involved and it can take days, even weeks, to sort out a specific date and time when everyone can meet. Intranet tools eliminate this problem because they allow specified parties to view others' calendars. This makes it very simple for an admin, or other individual, to compare each person’s intranet calendar and simply choose a time when everyone is available. This not only saves a ton of time and emails, but it allows meetings to get scheduled faster, thus helping accelerate overall progress. HR departments typically lack the time necessary to complete everything they need to do. Most HR departments struggle to complete essential items, while items of lesser importance get pushed to the bottom of the priority list ... and possibly never get completed at all. With intranet tools, you can set up an easy-to-access central repository of HR documents that employees can access at any time. By directing employees to a specific location, you will greatly reduce the amount of questions HR needs to answer. Fewer questions for HR leads to more available time for them to complete the necessary items on their to-do lists. Mistakes are inevitable at every level of an organization. However, they can be drastically reduced if employees can access the information they need ... when they need it. Intranet tools provide a perfect platform for organizing information essential to everyday tasks. Access to the right information can largely reduce the number of errors made by employees, saving countless hours that would otherwise be spent trying to correct them. The key is to keep all central information up-to-date and organized in a clean, intuitive manner ... and make sure every employee understands where to go to find the documentation they need. While no amount of money can manufacture additional hours in the day, the time saved by using intranet tools is about as close to creating more hours as you can get. When used correctly, the cost required to implement and use social intranet software can be returned to you 100-fold, or more, in the form of increased productivity, employee engagement, and reduced business mistakes.